2-Methyl-1,3-propanediol (MPO) and dipropylene glycol (DPG) are safe, liquid glycols used in a broad range of industries as reactive diluents, viscosity reducing agents, solvents, carriers, and chemical intermediates. Both MPO and DPG are branched aliphatic diols which inhibit crystallization tendencies and exhibit a broad range of solvency. Formulators use MPO and DPO as chemical intermediates in the manufacture of high-performance polyurethanes, polyester polyols, unsaturated polyester resins, saturated polyesters, and alkyd resins. In these resin systems, they contribute flexibility, reduced crystallinity, transparency, and hydrolytic stability. Formulators use MPO and DPG in large volumes because of their lower costs, good reactivity, and compatibility characteristics with other raw materials. Polyester resins based on these two glycols exhibit lower viscosities versus polyester-based glycols like ethylene glycol (EG) and neopentyl glycol (NPG). However, DPG’s supply-demand balance has recently changed, sparking cost increases and causing formulators to seek alternatives to DPG. Yet, there is a real basis for considering MPO as a value-added alternative to DPG based on similarities in solvency, reactivity, physical characteristics, and end-use performance. Other low-toxicity glycols that can be substituted by MPO include 1,3-butylene glycol (1,3-BG) and 2-methylpentane-2,4-diol (HGL). To begin, let’s take a look at the chemical-branched diol structures of MPO and DPG, respectively, as shown below. Note that DPG is a mixture of three isomeric chemical structures, with each of the three isomers having the hydroxyl functionality connected differently. The di-secondary (CAS 108-61-2) and the secondary-primary (CAS 106-62-7) DPG isomers, shown below, are the dominant isomers; the di-primary (CAS 110-98-5) DPG isomer exists at low levels. Both hydroxyl moieties on MPO are at the higher-reactivity primary positions, albeit sterically-shielded by the presence of the pendant methyl group. Overall, MPO affords higher reaction rates and greater reaction completeness. We estimate the esterification rates with MPO are about four to five-fold faster than with DPG with aromatic acids like IPA and TPA, or adipic acid. Furthermore, MPO reacts cleanly without side reactions seen with many other glycols, and MPO is also less hygroscopic in nature than DPG. MPO and DPG are available in industrial grades and high-purity grades. MPO is a co-product in the manufacture of 1,4-butanediol, while DPG is a co-product of mono-propylene glycol production. The global production capacities for MPO and for DPG are about 150,000 MT and 200,000 MT respectively. 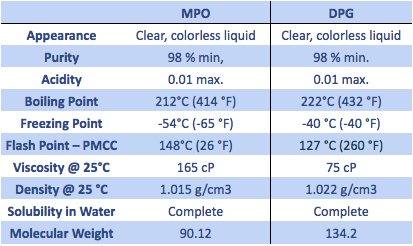 MPO and DPG both contain polar hydroxyl functionality and non-polar methyl groups, which promote a reduction in crystallization and a wide range of solvency, viscosity reduction characteristics, and intermolecular compatibility. Further, MPO contributes to increases in UV resistance and abrasion resistance. These attributes lead to utility in a wide range of applications, as a carrier, solvent, reactive diluent, or as chemical intermediates. MPO and DPG are very similar when looking at their key properties, which promotes the possibilities for considering MPO as a replacement for DPG. A side-by-side comparison of various properties of the two glycols is provided below. Both MPO and DPG are inherently biodegradable. Both MPO and DPG have very low hazard profiles as indicated below. MPO is not considered to be hazardous based on available toxicology data. A compilation and assessment of toxicological data on MPO was published by the Commonwealth of Australia, Department of Health and Family Services. A summary of the acute toxicology from this report is summarized below. The summary report from the Commonwealth of Australia can be accessed at the following link: www.nicnas.gov.au/__data/assets/word_doc/0005/19787/NA279FR.docx. An additional database of reports on the environmental, ecotoxicological and toxicological aspects of MPO is available in the following reference: https://www.sciencedirect.com/science/article/pii/S027323001730346X. Human skin sensitization studies on MPO reviewed by the authors in the above reference were considered to represent a low risk to human health. There were no findings of toxicological hazard significance for MPO in controlled laboratory animal studies. They also found MPO to present a low toxicity hazard to aquatic species, with low potential for bioaccumulation or persistence. The referenced authors concluded there was a lack of toxicity or environmental hazards across all media and test systems they reviewed. Gantrade’s Sales Specifications for Industrial Grade and a High Purity Grade of 2-Methyl-1,3-Propanediol (MPO) are shown below. MPO is available from Gantrade Corporation in 20 MT ISO Tanks, road tank trucks or 200 Kg. steel drums. MPO is stable under recommended storage conditions. It should be stored in a dry, cool and well-ventilated place. Keep/store away from extremely high temperatures, ignition sources, direct sunlight and UV sources, or incompatible materials. For additional information, request a Safety Data Sheet from Gantrade Corporation. 2-Methyl-1,3-propanediol (MPO) and dipropylene glycol (DPG) are quite similar diols in their key properties. Both are versatile glycols used in a broad range of industries as reactive diluents, carriers, solvents, additives and chemical intermediates for high-performance polyesters and polyurethanes. Recent tightness in the supply-demand balance for DPG has led formulators to substitute MPO as a viable alternative glycol. Distinguishing features of MPO and DPG are their ability to disrupt crystallinity, their broad solvency range, low toxicity, and good handling characteristics. In polyesters they afford resins with lower viscosities and good solution characteristics, facilitating high solids compositions. For more information on how MPO can work for you, contact Gantrade Corporation today.